This article contains affiliate links. If you click and make a purchase I will make a commission at no extra cost to you. This article was first published on Dec 05, 2017 and updated in March 2018. Kampot is a favorite retreat away from the chaos of Phnom Penh for both locals and expats. Located just 2-3 hours from Cambodia’s capital, the sleepy riverside town of Kampot is the perfect answer to a rejuvenating few days away from city life. Whether you are interested in lounging by the river, pampering yourself at a spa, soaking in the beautiful countryside scenery on a farm tour, or want to get active in nature, Kampot has something for you. There is a seemingly endless list of activities to enjoy both on and off the beaten path. The growing foodie scene in Kampot is one of its hidden charms. There are a number of delicious restaurants to choose from for both Cambodian and international fare. Many businesses in Kampot are socially minded and have a mission attached. You can support these organizations simply by using their excellent services. When supporting any charity organization, it is important to know where the money is going. We have only included businesses modeling sustainable and responsible practices. We have put together an ultimate 4 day itinerary for Kampot including what to do, see and eat to maximize your time in this beautiful, laid back riverside town. 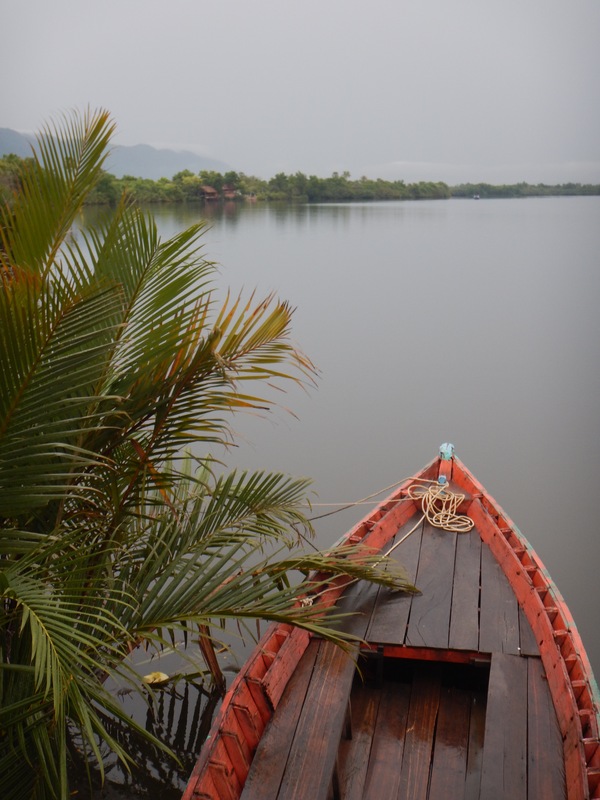 Read on for your 4 day Kampot travel guide. Note: All prices listed are in US Dollars, which is the most widely used currency in Cambodia. Cambodian Riel is the local currency, which is mainly used for giving change. 4000 Riel=1 USD (approximately). 9am: Breakfast at Epic Arts Cafe; Great people, great food, great cause. While Kampot province is rich in arable land and has a diverse range of natural resources, from durian to rubber, it is famous for one thing: pepper. The climate, soil and terroir of the region combine to form a very unique flavour that delivers some of the most distinct, lingering flavours and aromas. Dating back to the French colonial era, this lush province has been producing this very special pepper. During the Khmer Rouge takeover, and after the Battle of Kampot, much of the pepper plantations were destroyed and farmers were forced to grow rice. 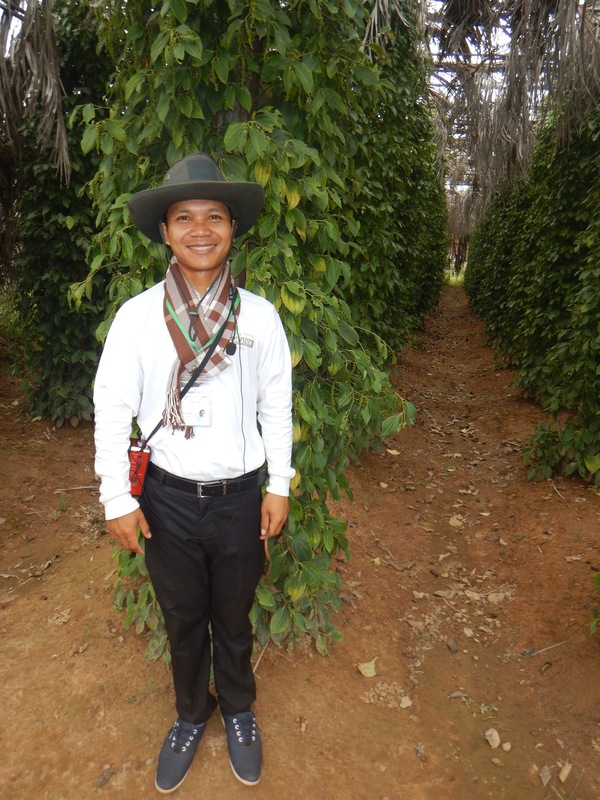 But when peace returned to Cambodia in the early 1990s, farmers started to restore the pepper plantations. Kampot pepper has now become a specialized product has the seal of Protected Geographical Indication (PGI), a law from the European Union that recognises exceptional quality from a region, much like wine appellations Champagne or Côtes du Rhône in France. It is the first pepper in the world to be awarded the PGI certification. If you purchase authentic Kampot Pepper, you know it was grown 100% organically, prohibiting the use of chemical fertilisers or pesticides, and it is produced using either Kamchay and Lampong (Belantoeung) of the piper nigram sub species. 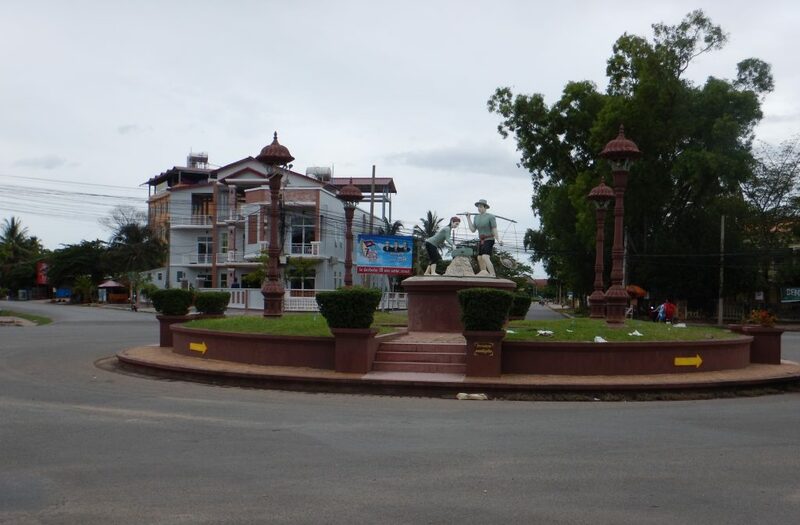 Kampot city was an important sea port after losing the Mekong Delta and before the establishment of Sihanoukville. 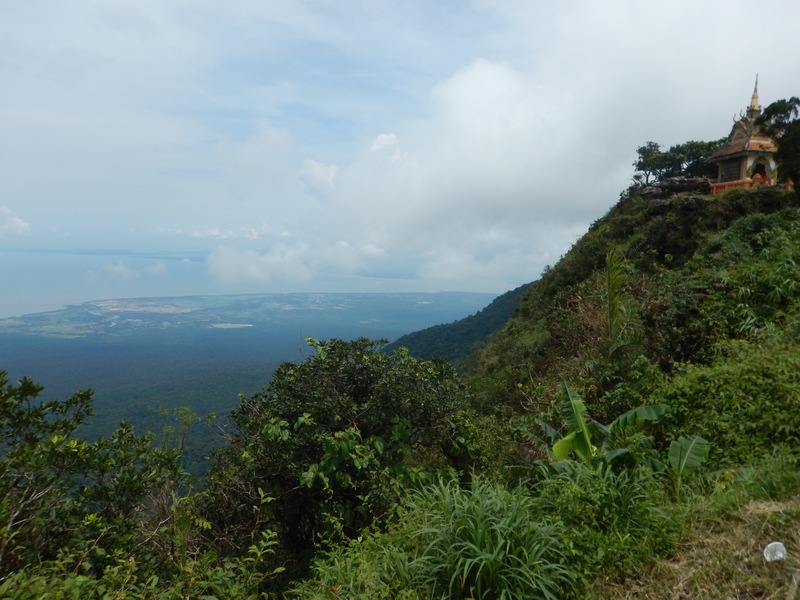 It is where most explorers will base themselves when trekking the Dâmrei and Bokor Mountains. If you arrive in Phnom Penh in the morning and have not eaten breakfast on the flight, you can eat at the Costa Coffee, a coffee chain just outside of Arrivals at the airport. For hungry travelers looking for a familiar taste, ask your driver to stop at Mike’s Burger House, a local and expat favorite, about 10 minutes from the airport on the road toward Kampot. For Cambodian comfort food, The Park Cafe is another option, located directly across the street from the airport. You can take a taxi or private car directly to Kampot from the Phnom Penh International Airport, which takes 2-3 hours. Book at least a week in advance to avoid disappointment. For more options on transport, see our Travel to Kampot section below. Once you reach Kampot you can go straight to check in at your accommodation and then head to your first local hearty meal. After checking in to your hotel it’s time for lunch. You can grab a bite and relax at your accommodation or eat in town. If you choose the latter option, we recommend eating at Ellie’s Cafe, a laid back, cosy restaurant serving healthful and delicious food. This is a favorite spot among expats and travelers, and the friendly staff are always willing to offer advice on what’s happening in town. After lunch, depending on your energy level, you can explore Kampot town or you may want to dedicate the afternoon to relaxation and spa time. 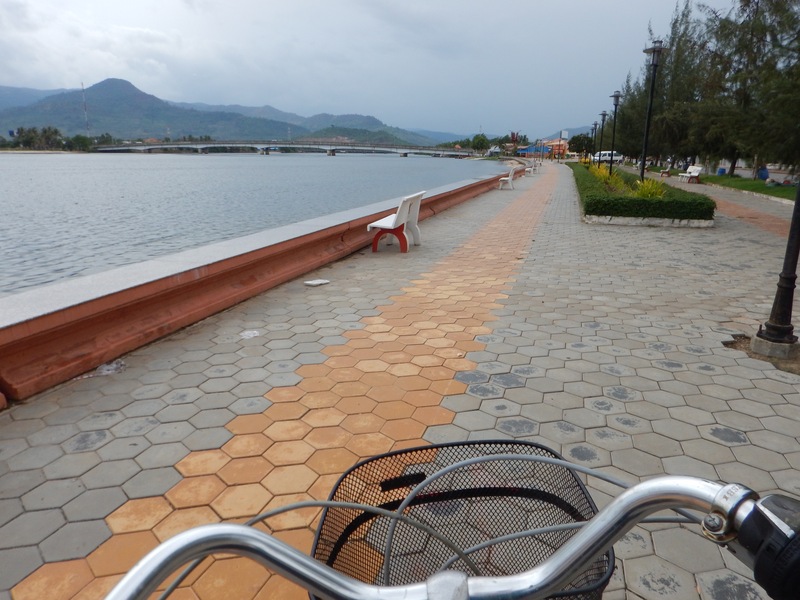 You can explore Kampot’s town on foot or cover more ground by bicycle. We definitely recommend a bicycle so you can get a feel for the area. Stop in at just about any guest house along the riverside to rent a bicycle ($1-$2/hour). Be sure to rent a helmet as well. 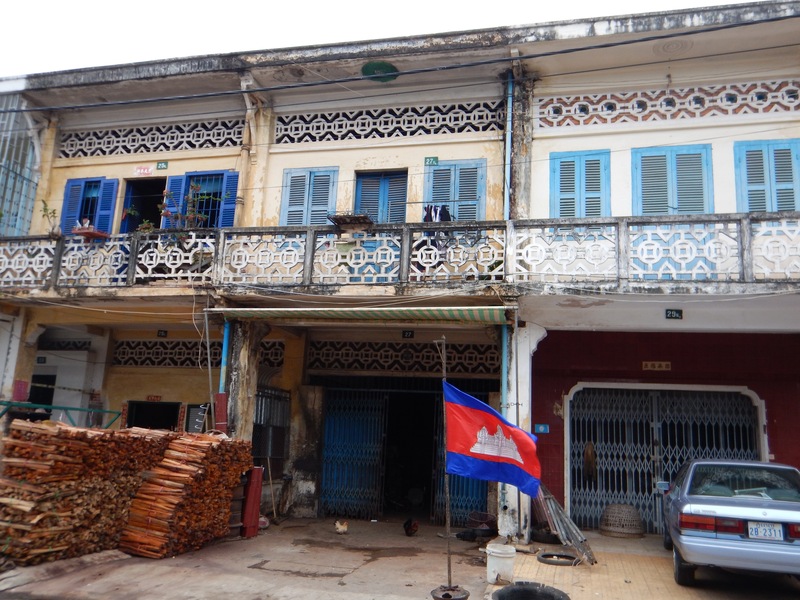 Kampot is one of the few places in Cambodia that retains many charming, and some crumbling, French colonial buildings. As you wander around you may notice some buildings with only very tiny openings and no windows, swarming with small birds. These have been turned into nesting homes for swallows in order to collect their nests, which are sold for Chinese medicinal bird’s nest soup. You will have fun just meandering about at your leisure without a set route, but we have included some stops below that you may want to check out. Kampot town is small and fairly easy to navigate. Cambodians are extremely friendly, and if you do feel lost, ask just anyone around to point you back towards the river. If you are more interested in relaxing, we have some excellent spa recommendations. Banteay Srey is a reason to go to Kampot in and of itself, and is a must do at some point during your time in Kampot. This women’s only spa located right on the river, across the New Bridge and only minutes from town, is pure serenity and relaxation. 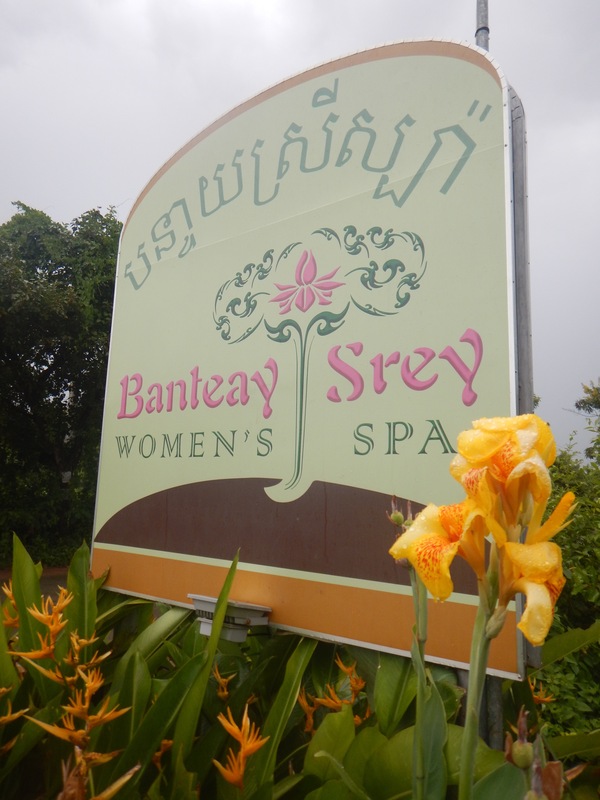 Banteay Srey’s spa treatments all utilize local ingredients, such as kaffir lime, coffee, coconut oil, and even a Kampot pepper body scrub (be warned, it feels as spicy as you would imagine!). There are a range of massage options, but the aromatherapy is a favorite. A steaming bowl of jasmine tea placed on the floor below your face ignites your senses while the skilled masseur works into any areas of tension, sending you into blissful, dreamy relaxation. There are also manicures and pedicures, dry brushing and even haircuts. If I had to choose I’d say the facial is my favorite treatment. The seemingly endless ingredients used smell so delicious, you’ll want to eat everything they’re putting on your face. Don’t do it though! The fabulous kitchen has you covered. A sheltered wooden deck along the water has comfortable cushions to sprawl on while you enjoy refreshing smoothies and tasty vegetarian food. The menu also includes Cambodian coffees, teas, wine and desserts to satisfy a sweet tooth. You are also welcome to come to the spa just for lunch and a swim. Rubber tubes and sarongs are available for guests to use. If all of this isn’t enough, Banteay Srey is also a training facility giving Cambodian women the opportunity to develop a wide range of marketable skills in Cambodia’s growing hospitality and wellness industry. The Banteay Srey project provides a supervised residence where young women can develop their independence in a comfortable safe environment. Trainees are offered a maximum of 2 years training and employment at the center, and upon graduating are given support to find excellent job placements in spas, resorts, or restaurants. English, Khmer, and basic mathematics studies are offered. The women can also take yoga and meditation classes to support their personal growth and healing. Banteay Srey also offers morning and evening yoga classes, usually held at 9:30am and 5pm, but double check the website to confirm the time. Men are allowed to attend the morning yoga session. A second option for massage and beauty treatments that also accepts men is Jolie Jolie Beauty Salon, located in Kampot town. Treatment options include massage, manicures, pedicures, scrubs, facials, and waxing in a relaxed and quiet setting. 100% natural products are used for all treatments. You’ll likely need a good caffeine boost to prepare you for the day ahead, and Cafe Espresso is the place to go. This hip restaurant that serves delicious food boasts some of the best coffee served in Cambodia. It is brewed on site, and serves scrumptious and flavorsome meals to jump start your day. Cotton t-shirts – ethically made with the softest cotton jersey, a building block for your everyday wardrobe. Thanks to @raintreecambodia for this lovely shot! Cafe Espresso is located directly next door to Dorsu, a Kampot-based clothing line of ethically produced, well made wardrobe staples made to last. Dorsu provides skills training for Cambodian women. Clothing is produced on site, and you can stop in to see the production while you shop. Salt is an important product from Kampot, with distribution throughout Cambodia and neighboring countries. The Kampot salt fields are located about 20 minutes outside of Kampot town, conveniently on the way to most of the pepper plantations. Harvesting season for salt production is between November and February and is the best time to go to see workers cultivating the fields. There is a small exhibition center near the salt fields where you can learn about salt production and watch a short video. 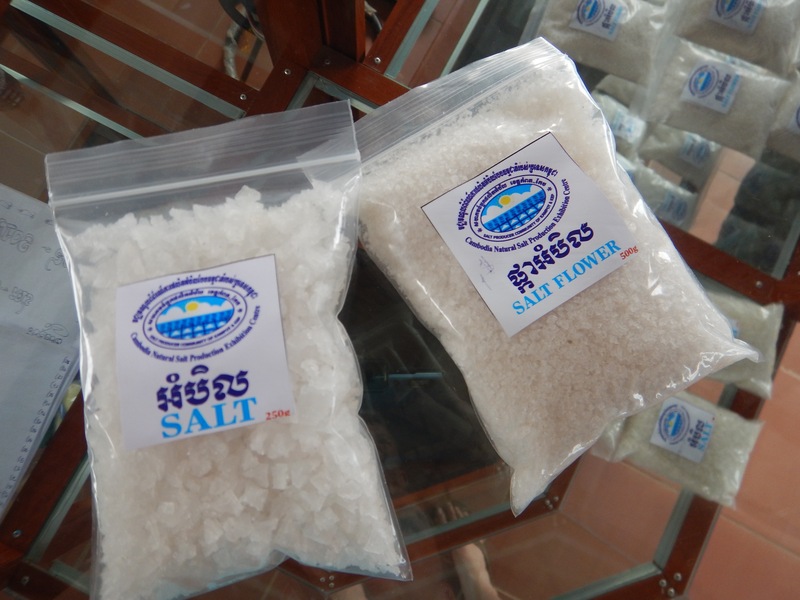 You can also purchase Kampot salt and salt flour on site to bring home. Pepper is Kampot’s claim to fame. The region’s rolling hills and close proximity to the sea create a perfect environment to produce pepper plants. 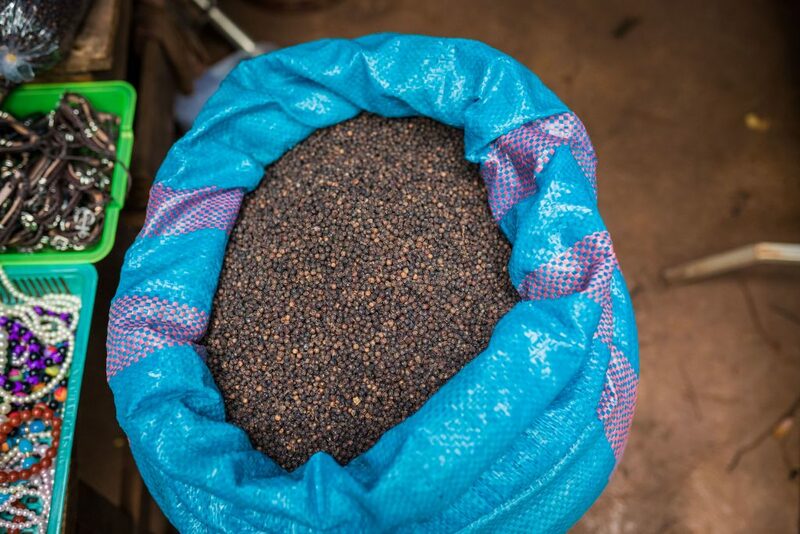 Before the Khmer Rouge took power in Cambodia in the 1970s and decimated crop growth, Kampot peppercorns were world renowned. Today the pepper industry is once again helping to revive the area. 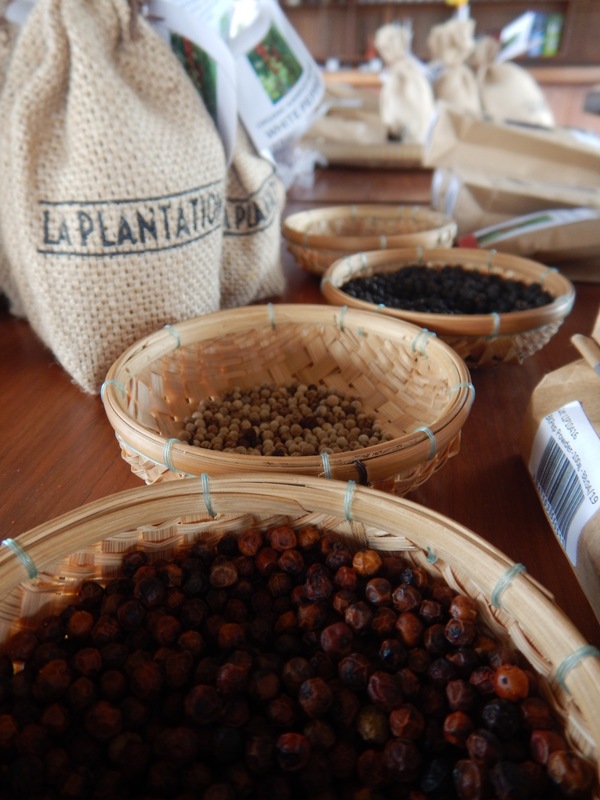 In 2016 Kampot pepper became one of 20 products outside the European Union to have Protected Geographical Indication (PGI) status, likening it to Cava wine from Spain or Prosciutto from Italy. La Plantation offers free tours of their farm. The ride to the farm from the center of Kampot town takes 45 minutes to an hour (30 minutes from the salt fields), bringing you along red dirt roads and through villages and rice paddies. You will pass the Secret Lake on the way, a beautiful manmade lake created under sad circumstances during the Khmer Rouge times. The journey out to the pepper farm is an experience in itself, giving you a glimpse of rural Cambodian life. 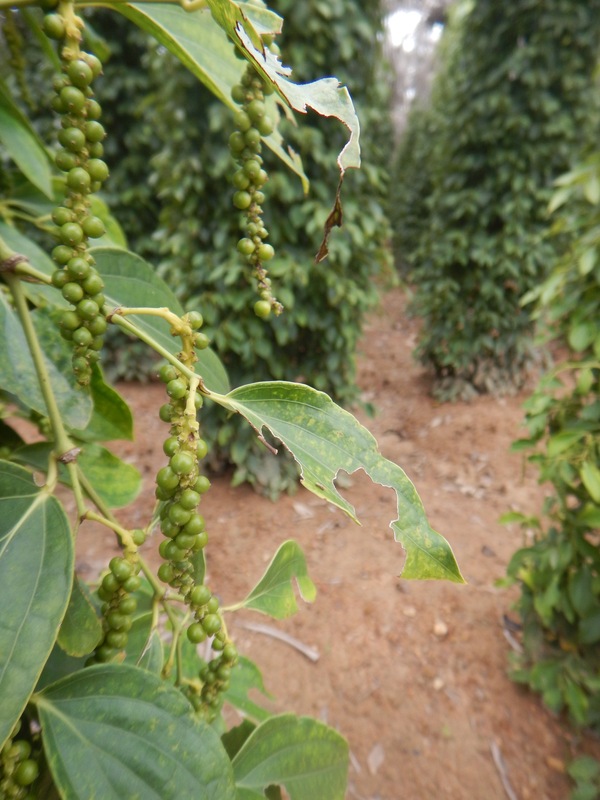 La Plantation produces red, white, black and green pepper, which can all be purchased on site. 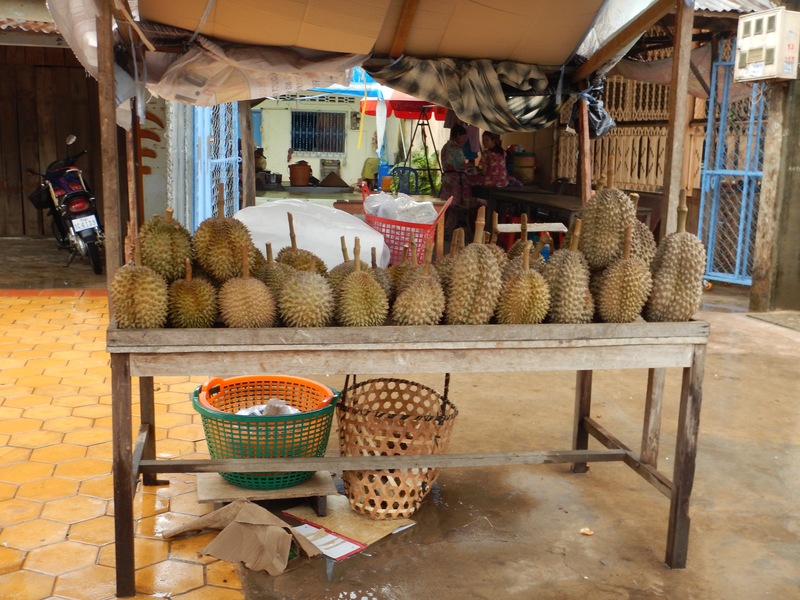 Kampot is also famous for durian, a large spiky fruit with custard-like yellow flesh inside, infamously known for it’s powerful stinky smell. 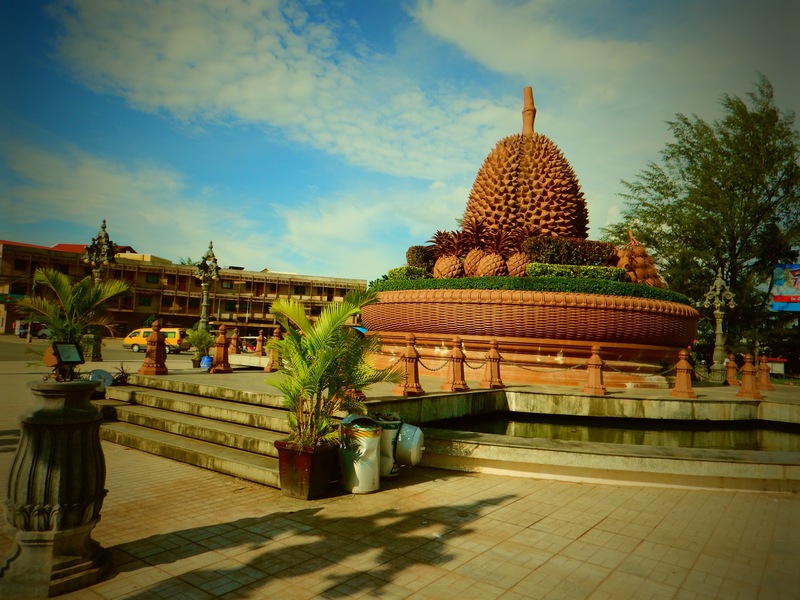 There is even a giant durian statue in the middle of the main roundabout in Kampot! There are durian plantations about 20 minutes outside of Kampot town. Ask the staff at your accommodation about which farms are producing and offering tours at the time you are there, as this tends to change based on the season. Tours for the pepper, salt, and durian farms can be booked through your hotel, but it is just as easy and more economical to hire a tuk tuk driver for the day who can bring you to breakfast and then on to the farms independently. Professionals at the farms can lead the tours there and provide information. 1) La Plantation has a restaurant on the premises serving dishes cooked with pepper grown on the farm. Lunch stop. One of our best meals of the trip. 2) Another option for lunch is Khmer Roots Cafe, located nearby the Secret Lake. This is a locally run family business and lunch bookings must be made one day in advance, which is easily done at their local number +855 88 356 8016. Only fresh, locally sourced ingredients are used and the food is cooked right in front of you, made to order. Khmer Roots Cafe also offers cooking classes, which must also be booked at least one day in advance. If you’ve got the energy, an afternoon kayak session is a wonderful way to continue your day in Cambodia’s beautiful outdoors. If not, relaxing by the river is the perfect way to unwind. 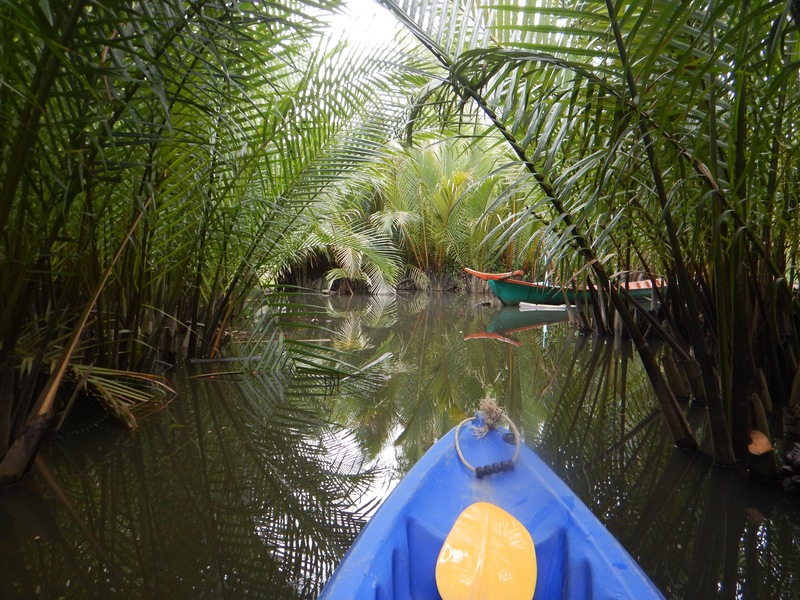 Kayaking the Green Cathedral is one of Kampot’s best kept secrets. I was honestly hesitant to share this tip as this is one of our ultimate favorite escapes into nature in Cambodia, especially because so few people seem to know about it! Bring your bathing suit and a modest cover up and take a tuk tuk to Champa Lodge, located about 20 minutes outside of the city center along the river. When you arrive you can rent a kayak there. The Green Cathedral is so named for the canopy of green that envelopes you as you kayak through the serene, narrow channel surrounding a small island in the river. The route takes approximately one to two hours, depending on your pace. The staff at Champa Lodge will be happy to explain the directions to you, which are fairly straightforward as you are basically just going one direction in a loop. The water is calm and kayaking there is not strenuous, even for beginners. We recommend wearing a cover up over your bathing suit, even with your life jacket on, as you will be passing local homes during the trip and showing too much skin is taboo in Cambodia. Our favorite time of day to do this kayaking trip is around 3:30pm when the sun is not too high in the sky and the fishermen in the Cham village adjacent to Champa Lodge are preparing their boats to go out for the evening. When you return from kayaking you can sit out on the deck at Champa Lodge overlooking the river and enjoy a drink as you watch the turquoise fleet of motorized fishing boats rumble out of the fishing village toward the sea for the night. One of the best things to do in Kampot is absolutely nothing at all, as it is so laid back. If you are staying at accommodation on the river you can enjoy the afternoon lazing around there, or check out another guest house along the water. Many places have restaurants and decks with comfortable seating overlooking the river, so you can enjoy a snack, grab a drink, crack open a good book, and chill. If you are staying in town then you may want to pop over to the Natural Bungalows guest house, near the new bridge, with nice sitting areas right on the water and a lovely view for sunset. After watching the sunset and freshening up you’re sure to be ready to eat again. 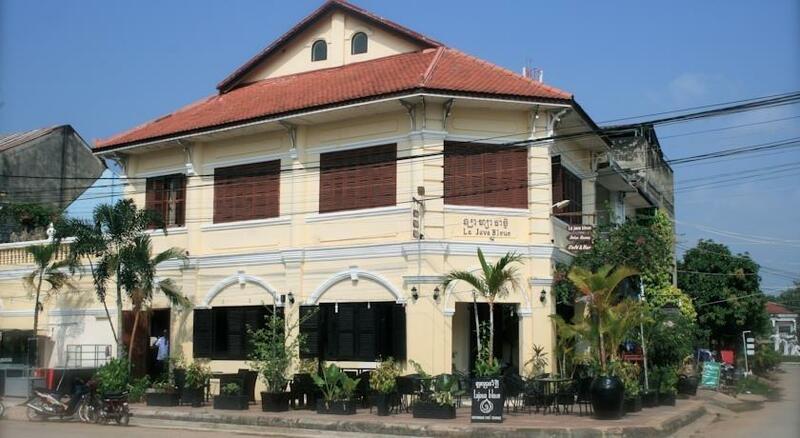 Tonight’s dinner will give you a taste of Kampot flavours and history. The Kampot Fishmarket is an exciting addition to the restaurant scene, and a sign of building restoration being done right in Kampot. Long time Kampot expats Jos and Hugh had a vision to breath new life into the historic 1930s fish market building, and they have done gorgeous work. Diners can enjoy the warm and inviting ambience inside, or dine overlooking the river on the large outdoor deck. 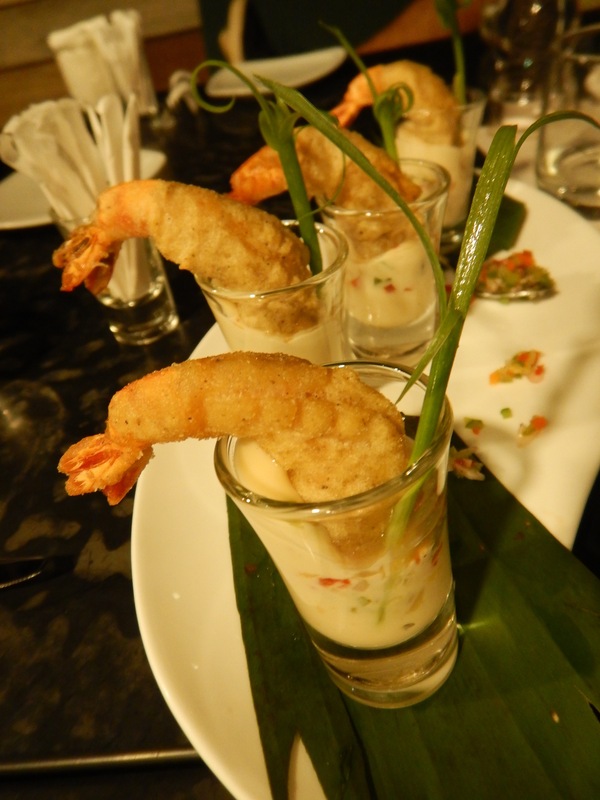 The menu includes freshly caught seafood prepared with locally sourced produce and spices. Vegetarians and meat lovers can also find flavourful offerings with a Cambodian flare. The food and ambience are a step above any other restaurant in the city; a great place to wine, dine, relax and impress. A rooftop bar is set to open soon, which will be a perfect spot to enjoy a sensational Kampot sunset and tasty libations. You can end the evening with a stroll along the river or through the town. If you want a night cap, there is a wine bar in town called Le Comptoir de Kampot, which is always great for some interesting conversation and an excellent selection of French and other imported wines by the glass. They also have a fantastic cheese plate, not always an easy find in Cambodia! 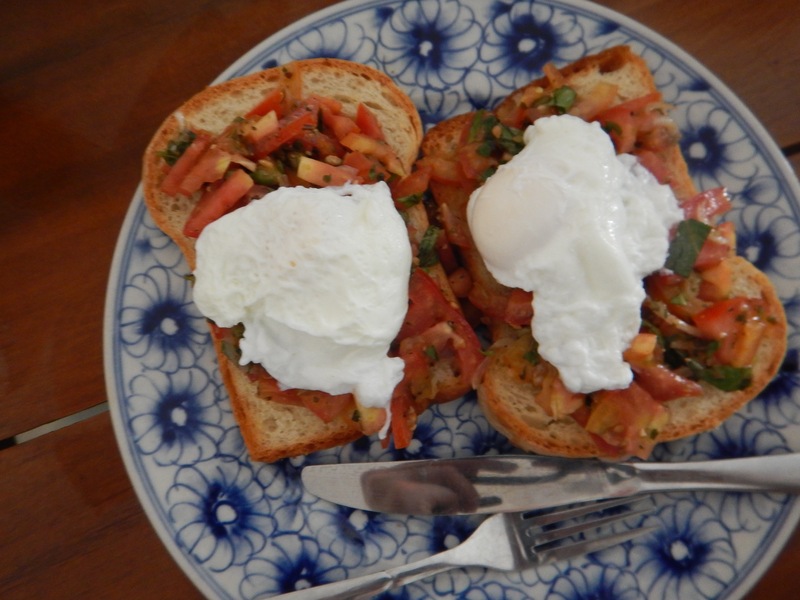 Epic Arts serves up some of the best breakfast and bakery items in Kampot. Started in 2006, Epic Arts is a social enterprise dedicated to increasing work opportunities for people with disabilities in Kampot while creating a positive and inclusive work environment. The organization has expanded its programming over the years, opening the first ‘Happy Cafe’ in Southeast Asia, in Kampot, holding regular events, and producing high quality music parody videos, which have quickly gone viral, spreading the message that every person counts. 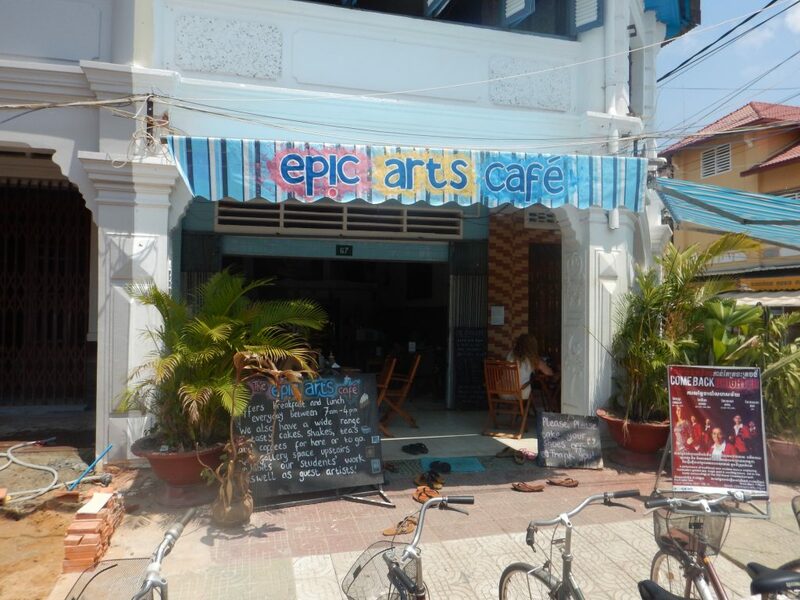 Epic Arts Cafe is a must visit during your trip to see businesses for a cause done right in Cambodia. We highly recommend their breakfast bruschetta and scones! If you fancy more shopping, Epic Arts also has a shop and inclusive work space called Epic Creations a few doors down from the cafe where you can purchase unique local products made by Epic Arts students. Free sign language classes are also available on occasion, so be sure to ask if you are interested. 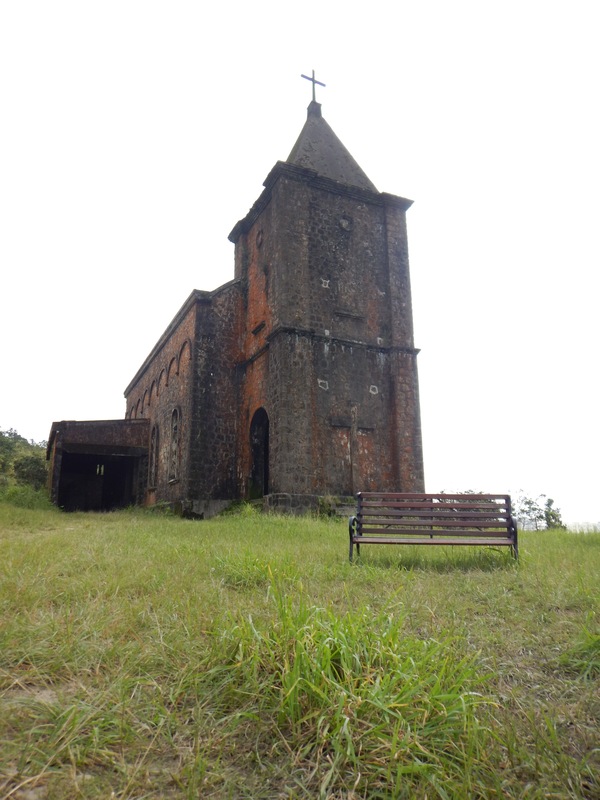 The quirkiest and most well known things to do in Kampot Cambodia is the trip up Bokor Mountain to see the Bokor Palace Hotel, aka “the old casino” and the abandoned Catholic church. Misty fog wafts up the cliffs most days, enshrining both structures and providing an eerie, post apocalyptic movie-set feel. Both buildings are reminders of the opulent, bizarre, and grim history that occurred in the hotel from the time of it’s creation in the early 1900s. If the weather is clear, the views over Bokor National Park down the Cambodian coastline are stunning. There are several other Kampot attractions up the mountain as well, including the new Tansur Bokor Highland Resort and casino built by Sokha Hotels, a 29m tall statue of Lok Yeay Mao, ancient mythical heroine and Buddhist divinity, the remains of Kind Norodom Sihanouk’s Black Palace, Wat Sampov Pram temple, on a cliffside overlooking the forest and ocean, and a few natural waterfalls. Your tour on the mountain can take anywhere from 1-3 hours, depending on how much you want to explore. Your accommodation should be able to help you secure transportation up the mountain. You can rent a car with a driver for about $40. Mini-bus tours are also available for about $10. One of the best ways to visit the mountain though is by motorbike. You can rent a motorbike for around $5 per day, not including gas. The trip up the mountain is about 40km from the city center. The attractions are marked on signs along the way and on top of the mountain. The road on the way up is newer and fairly well maintained, but if you are riding a motorbike be sure to take it slow around the mountain curves. 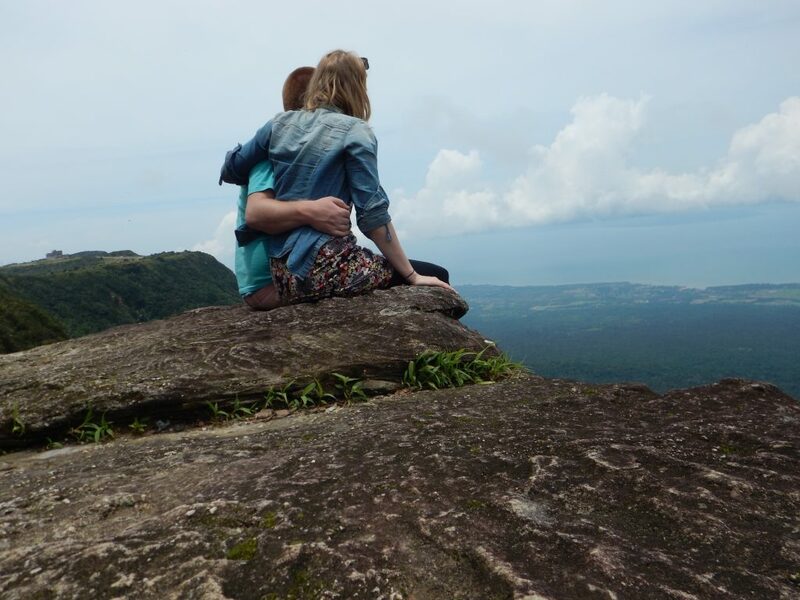 You may also want to bring a sweater or scarf as it can get quite chilly at the top of the mountain, an unexpected feeling to experience in Cambodia! There is food available at the Thansur Bokor Highland Resort, but you might also want to bring your own food and picnic at a lookout point on the mountain. Otherwise, you can head back into Kampot town for lunch. Once you are back in town you can relax, head to a spa, tour the city by bicycle, or get active on the water! 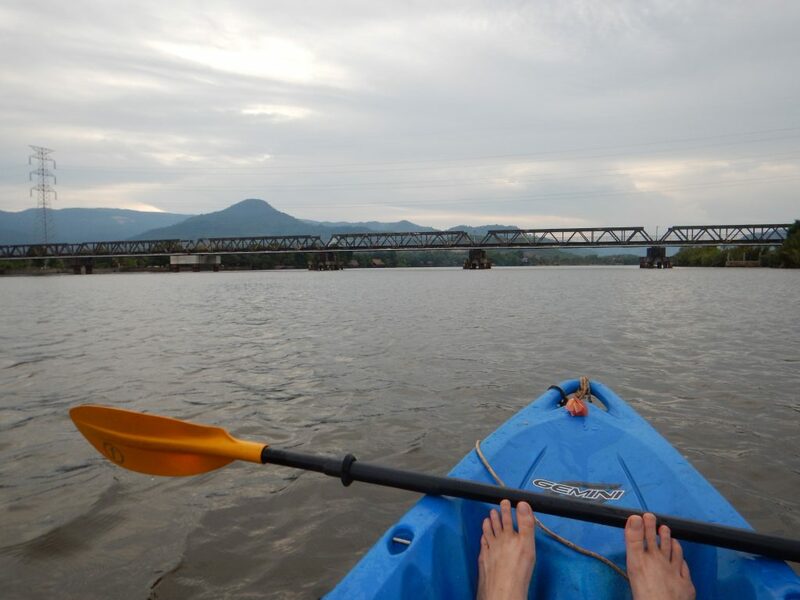 If you feel like getting active you can rent a kayak or canoe, available at most accommodation along the river. For a unique adventure that will make you feel good, try Stand Up Paddle Boarding (SUP)! 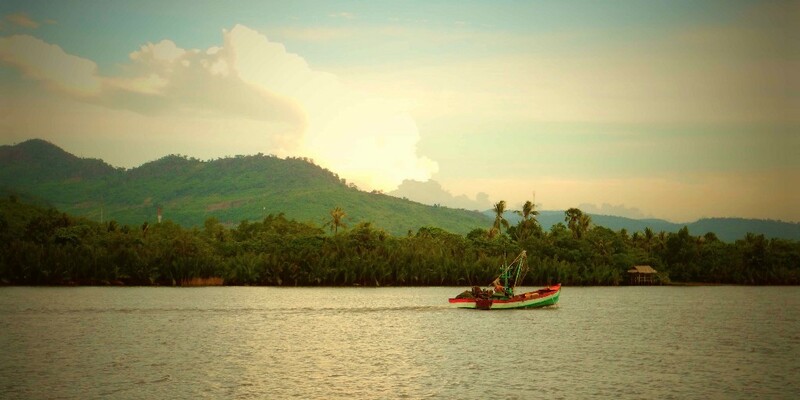 SUPasia offers daily classes taking you through fishing villages, pagodas, mangroves and more. They even offer a SUP Yoga class where you do yoga on your board in the middle of the river. Talk about a workout! Another great reason to visit Kampot. SUPasia focuses on providing a cultural experience to see life on the river, while having a low environmental impact. They also support Cambodian youth and environmental programs. There are several sunset and firefly cruises available in Kampot, departing along the river in town, close to the Fish Market restaurant. We suggest booking Captain Chim’s River Cruise. The two hour boat cruise along the river departs around 4-5pm and is a beautiful way to see the sunset and enjoy Kampot’s stunning natural surroundings. As the name suggests, you will also see fireflies most times of the year! Tapas, Cava, homemade limoncello, decadent desserts. You might not expect to find a Spanish-style tapas restaurant in small town Cambodia, but you certainly don’t want to miss out on eating at Baraca when you come to Kampot. Everything on the menu is delicious, which we can say with confidence since we have a habit of handing the entire menu to the server and saying ‘Yes.’ Seasonal menu items are also offered daily. We highly recommend the whiskey mushrooms and holy squid. SilkAir offers daily flights from Phnom Penh International Airport to Singapore. There is a 9:35am flight arriving in Singapore at 12:40pm. The trip from Kampot to Phnom Penh International Airport will take 2-3 hours. Again, we suggest booking a private car at least one week in advance through www.CamboTicket.com. 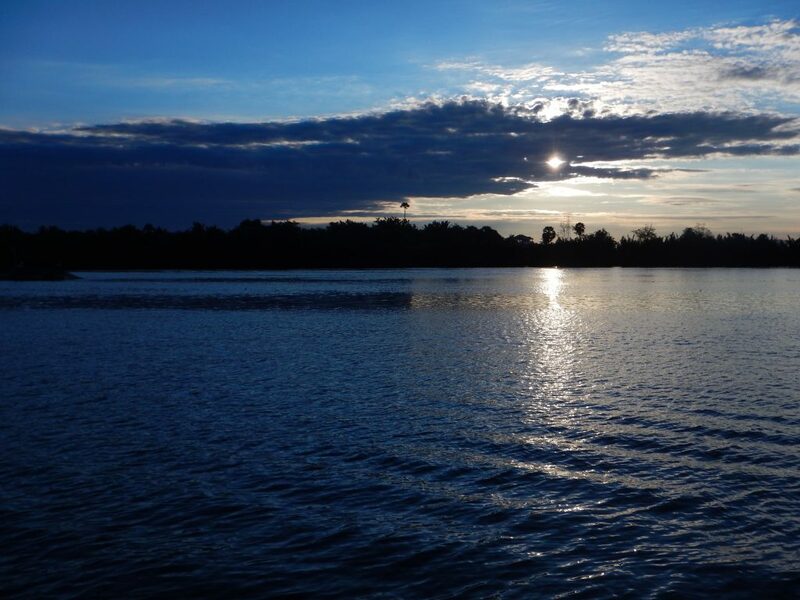 It is best to leave Kampot around 5:30am to ensure that you arrive with plenty of time to check in at the airport. 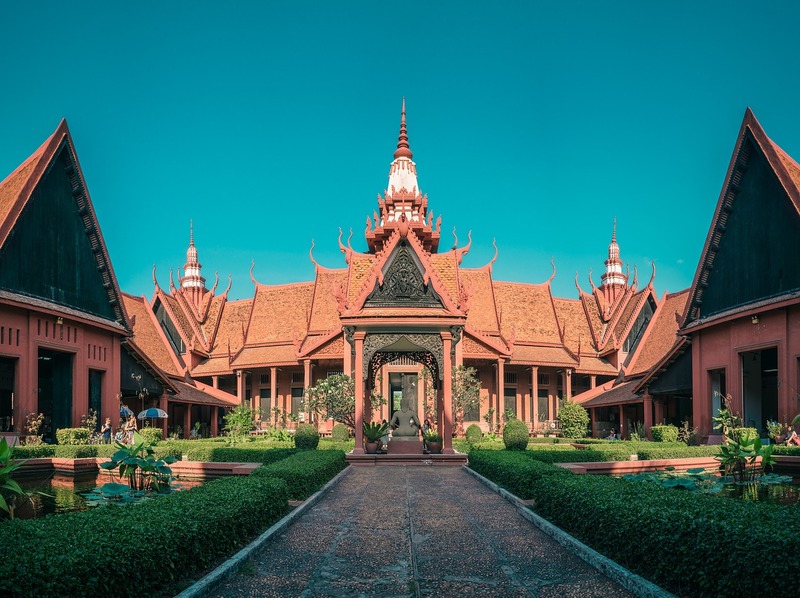 There are a few other fun and interesting things not mentioned in this itinerary that you can do in Kampot if you have some extra time. If you have your own motorbike, you can travel about 45mins to the wondrous 7th century cave temple, Chhngok Cave, with a shrine dedicated to Shiva. 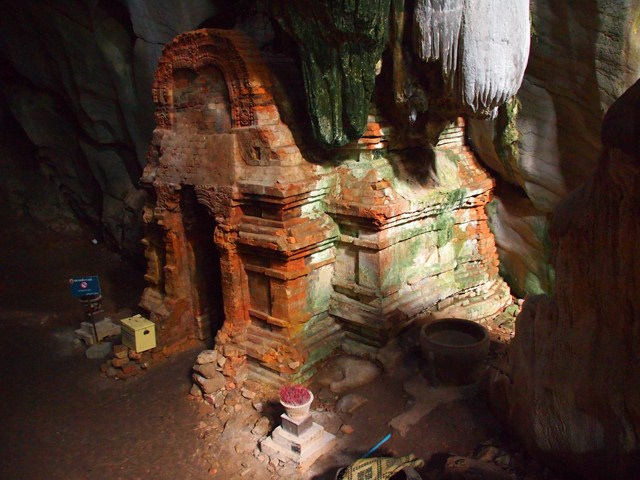 You can either visit the caves alone, hire a guide on-site or you can even get your fix of spelunking with Climbodia. The interior is stunning with stalactites and stalagmites from floor to ceiling. It’s also a good idea to stop here if you plan on visiting neighbouring Kep. Another way to enjoy the scenery from the river is to catch the Crab Shuttle that rides from Kampot to Kep on a regular basis. The boat journey along the Thai Gulf is highly rated on Tripadvisor and is a great alternative to riding the bus to Kep if you are packing light. It’s an 8-hour trip in total, with half the time traveling to Kep and back and the other half sightseeing. Lunch is also provided. 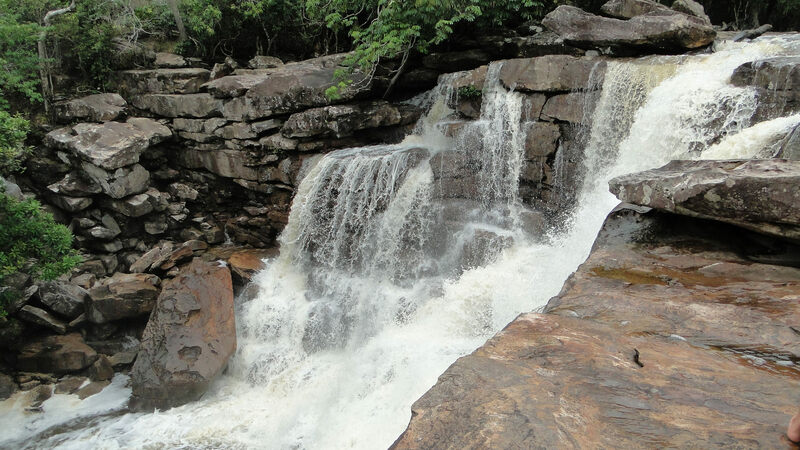 If visiting waterfalls is your thing, then travel the 5kms to Popokvil, a 2-tiered waterfall with a pool in the middle. It’s a nice place to relax for the day, but can get quite crowded. A visit during the wet season is recommended, as there is not much water in the dry season. There is also a local shop selling snacks and there is a small entrance fee, so bring cash with you. 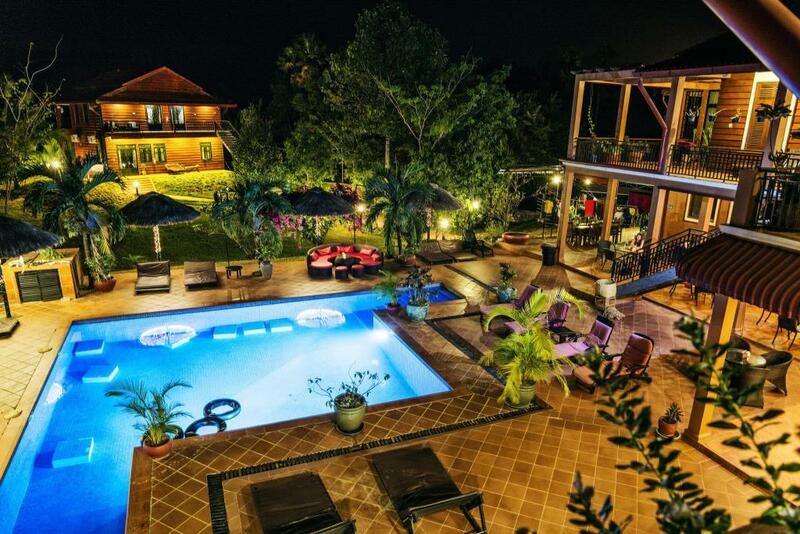 Here are our top picks of accommodation in Kampot. If you’re looking for accommodation Kampot has some really nice places along the river. We have five recommendations for where to stay depending on your budget and preferences. Champa Lodge is a unique and peaceful place to soak in Kampot’s laid back vibes. There are three traditional Cambodian stilt homes on the property, and only five rooms. 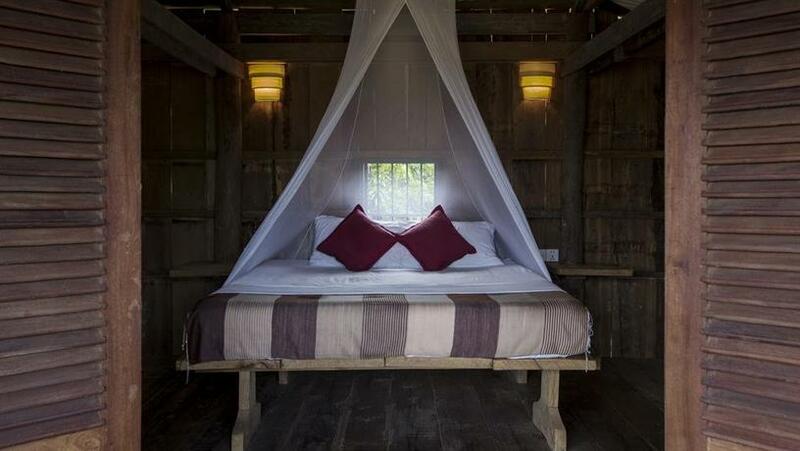 Champ Lodge is located on the river, about 20 minutes outside of Kampot town. 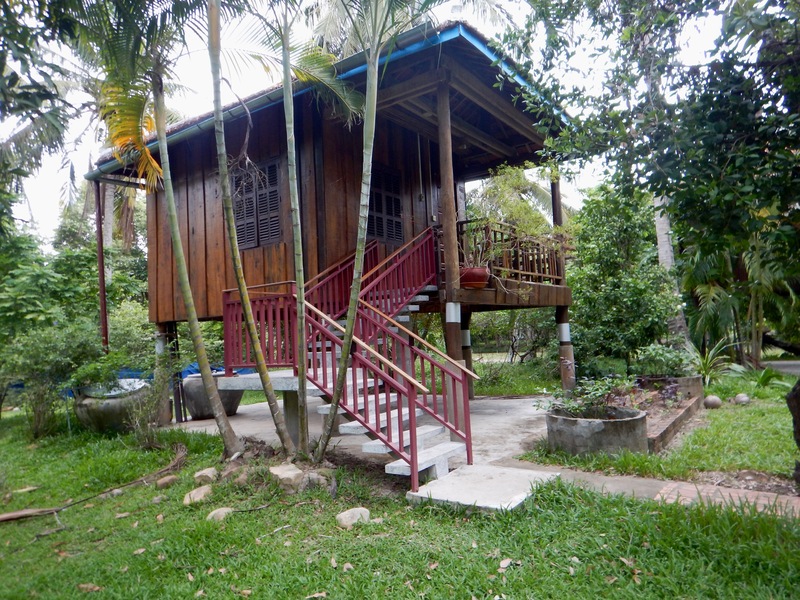 The property is near a Cham fishing village, farming communities, Buddhist Wats and Cham Mosques. Cambodian and International dishes are served in the restaurant, and most produce used is grown the organic garden on site. There is also a large selection of Belgian Beers as the co-owner is Belgian. Kayak, bicycle and boat rentals are available. Located on the river about a 15 minute tuk tuk ride from the center of town, French owned Les Manguiers is a beautiful escape into nature. There are a variety of bungalow options to choose from, and even a house to rent for large groups. Breakfast is included, and trust us, you won’t want to miss it! Lunch and dinner are also served. Bicycle, kayak and motorbike rentals are available. La Java Blueue is your for a hotel in Kampot. 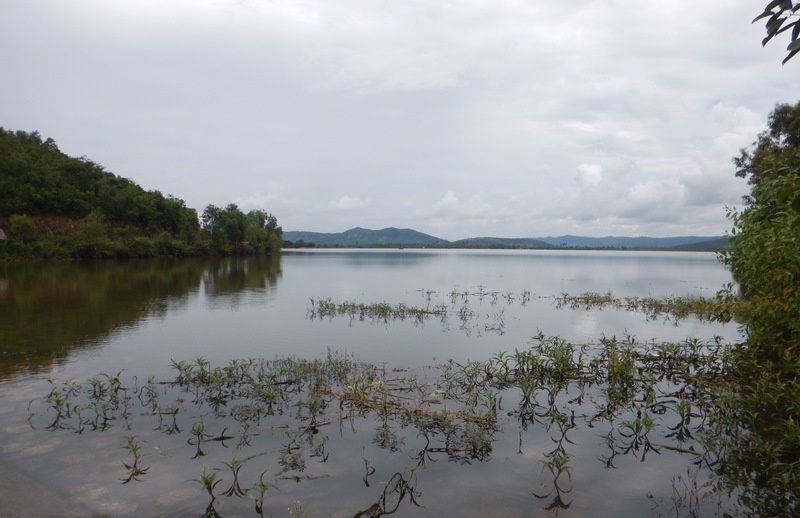 We prefer to stay in a bungalow by the river instead of hotels in Kampot. Situated in the French Quarter of downtown Kampot, La Java Bleue is a beautiful boutique guest house within walking distance of Kampot’s most popular restaurants, bars and shopping, and only a five minute walk from the riverside. Rooms are stylish and comfortable, and a restaurant and bar are located on site. Motorbike and bicycle rentals are available nearby. This budget friendly option is located directly on the river, lending it a calm and relaxing atmosphere, yet it is only a 5-10 minute tuk tuk ride from the center of town. Modeled after a traditional Cambodian village, the bungalows at Samon’s Village are basic with no hot water and coconut shells with holes serving as shower heads. This rustic feel is charming if you’re not too fussy about amenities. The restaurant serves delicious home-cooked Cambodian food, some international options, and an excellent smoothie and cocktail menu. Motorbike, bicycle and kayak rentals are available. If you have kids and are looking for a more family-friendly option, Villa Vedici offers a resort feel with a clean pool, kid’s pool and free wifi. There is also a bar to go with your sunbathing and a restaurant serving French cuisine. They have also made certain rooms with families in mind, so best to ask before booking. Flying through Phnom Penh International Airport is the easiest way to get to Kampot. There is a 7:40am flight from Changi Airport in Singapore on SilkAir arriving at Phnom Penh International Airport at 8:35am. 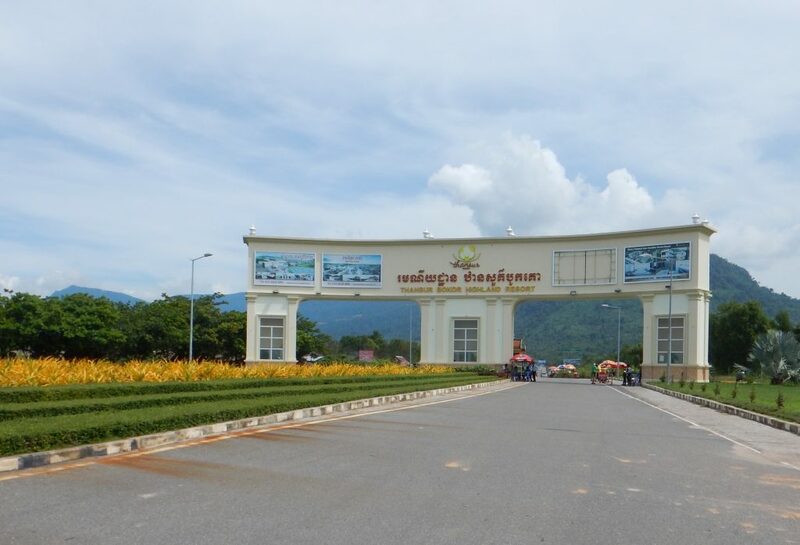 You can take a taxi or private car directly to Kampot from the Phnom Penh International Airport, which takes 2-3 hours. We suggest booking at least one week in advance through www.CamboTicket.com, an online transportation booking company based in Cambodia. A private car will cost anywhere from $40-50 and is the most direct way to get there. You can catch a bus from Phnom Penh to Kampot in the Phnom Penh city center. But, going into town from the airport will cost you 1-2 hours of additional travel time and is not recommended. 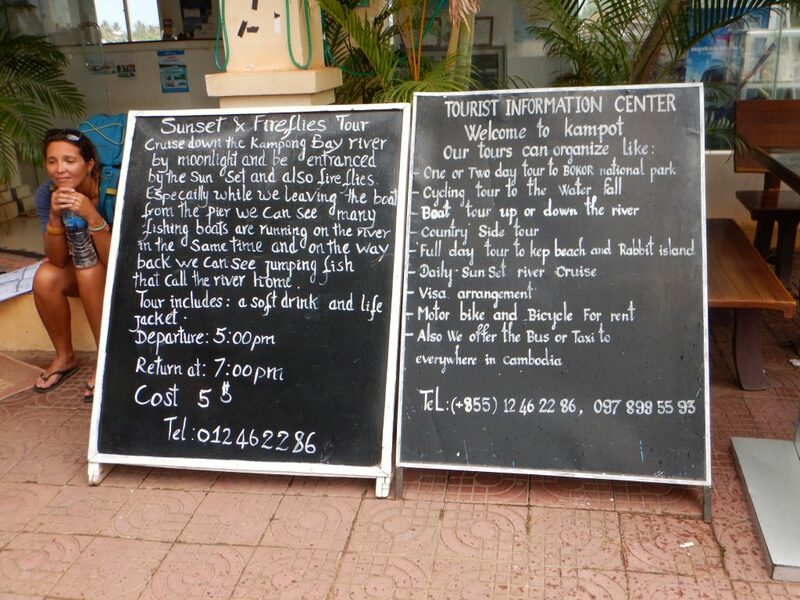 If you do choose to go this route, we recommend booking on Kampot Express or Giant Ibis. You can also search the Facebook group Taxi Share Cambodia for ride share and private car company listings. The drive to Kampot will take you past Cambodia’s gorgeous and expansive countryside, through several villages and small towns. There are serviceable rest stops along the way, but it is advisable to bring your own tissue paper for the toilets. 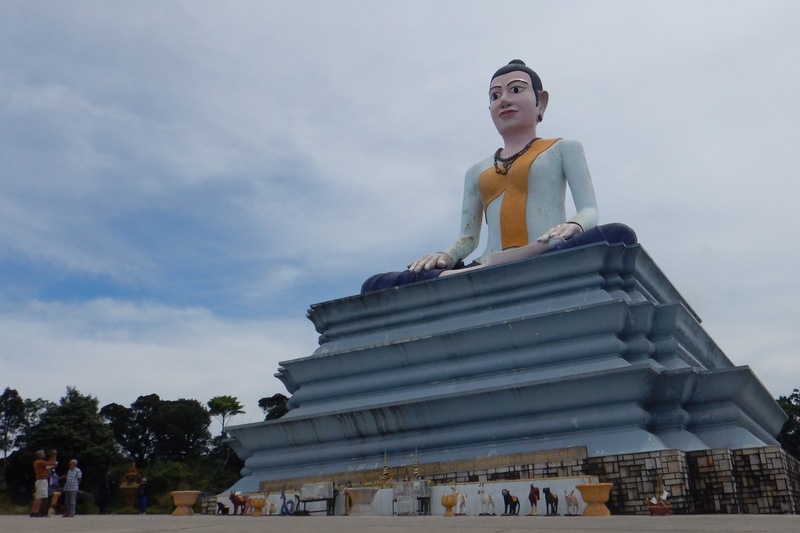 Kampot is both the name of the south west province and the capital of said province in Cambodia. Kampot province borders Vietnam, so it is a great addition if you’re planning to travel from southern Vietnam to Cambodia, where you can cross the border at Ha Tien. If you do cross here, you can either obtain your Cambodian visa at the embassy in Saigon, or you can get one on arrival at the border. 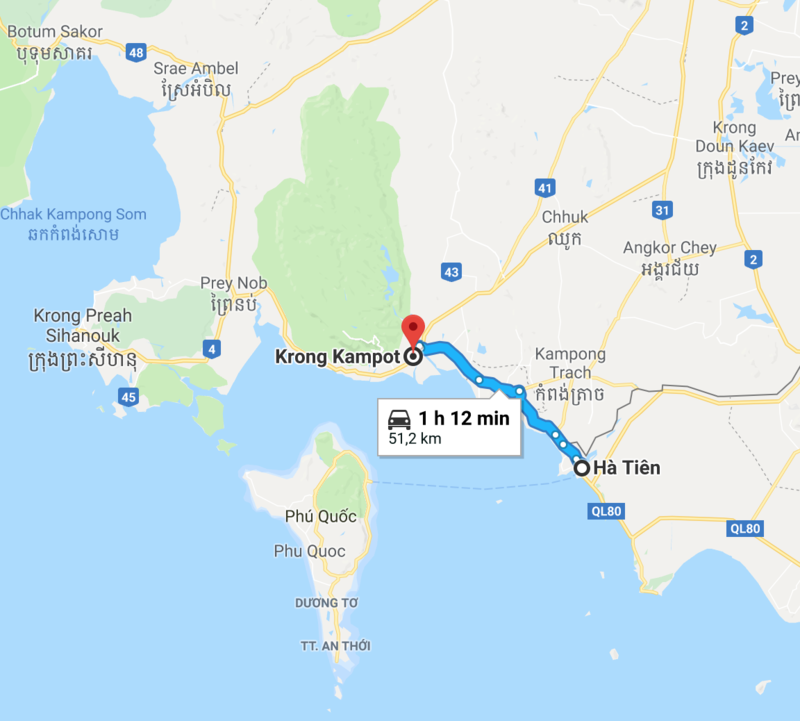 It takes around 2 hours to get to Kampot city from the border. The easiest and best way to get around Kampot and to the surrounding areas for activities is by hiring a tuk tuk, a motorcycle with a covered carriage attached. You can book a tuk tuk directly through your hotel and a driver will pick you up and take you wherever you may want to go. Typically the cost for hiring a tuk tuk for a whole day (6+ hours) is $20-$30USD. You can also agree to an hourly rate of $3-5/hour. Be sure to agree upon prices at the beginning of the day. Tipping is always appreciated, especially if you received excellent service. Quick rides into town from accommodation along the river should cost between $1-$3. If you are into the party scene and happen to be in Kampot on a Friday or Saturday night, you are in luck. Banyan Tree guest house and Naga guest house alternate with weekend parties, and are popular places for locals, travelers and expats to drink and dance into the wee hours of the night. Mad Monkey hostel also hosts parties and events throughout the week. Many creative people call Kampot their home, and there are events happening every week throughout the year from live music to art exhibitions to comedy shows. Check out the Kampot Survival Guide or Kampot Facebook page for the latest info and events, or talk to locals and expats in town to find out what is going on. It’s tough to fit all of the outstanding restaurants in Kampot into a few days. Singapore is 1 hour ahead of Kampot and Phnom Penh. • Don’t swim in the river after the sun goes down or while under the influence of any substance, as the current can be faster than people realize. • Kampot is relatively safe, especially compared with the capital city, Phnom Penh, but still be cautious with your valuables when you are out and about by keeping your bag across your chest and away from the street side when walking or in a tuk tuk. • Store your valuables safely in your room and bring a luggage lock. All images by Two Can Travel unless otherwise stated.